Small business owners are masters at making the most of limited resources, so when someone suggests that you should aspire to run a “lean” operation, you likely think, “We can’t get much leaner!” Crunching numbers, controlling overhead costs and trimming expenses are all smart steps toward streamlining operations and finances, but cloud computing – storing and accessing data and programs over the Internet instead of your computer’s hard drive –enables improved workflow efficiencies and productivity. This means that with the cloud you could achieve a new level of leanness that you may have not realized was within reach. Technology, which typically represents a sizeable expense for small business owners, can actually enable businesses to both reduce costs and grow. 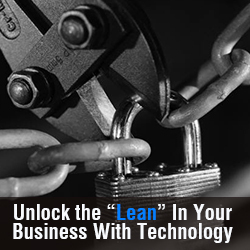 All small businesses inherently act lean to some extent because their livelihood is so heavily dependent upon ROI. Few investments offer greater return than modern technology. In fact, recent research from The Boston Consulting Group (BCG) discovered small-and-midsized businesses that use new technology had 10 points higher job growth and 11 points higher revenue growth than “low-tech” SMBs. Cloud technology is a major force driving those growth statistics. Benefits like scalability and increased collaboration are just a few of the ways an investment in the cloud translates to a leaner organization. For example, cloud technology can streamline data storage, file sharing and communications into a subscription-based model, which is more affordable for businesses that require flexible IT support. You pay for the computing you need, and if that need changes because of workforce expansion or contraction or cyclical demand, your cloud services scale with the business. The success of small businesses that rely on remote field staff or have customers in a variety of geographies can be stifled by the challenges of coordinating communications across disparate time zones and locations. But a powerful cloud-based productivity suite can bridge these divides with instant messaging, collaboration tools and a centralized document platform, available to any user via the Internet. Less time spent tracking down co-workers or the most recent version of an important shared document leaves more time to focus on core products and services. Technology that narrows the gap between a small business’ need and the ability to meet that need is an investment that pays off in the financial and operational progress of your company. Explore the cloud to see how your small business can function in a more rapid, synchronized and affordable way. 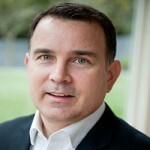 Russ currently serves as the senior director of SMB within the U.S. Small and Medium Business & Distribution (SMS&D) organization at Microsoft. He is an expert in the area of small business technology including the cloud, modernization and emerging technology trends.